Previous Post Book Review : Blind Faith by Michael Schneider. Next Post London Book Fair 2011. I grew up in an estate full of these trees. I used to love all the blossom on the ground. Lovely! Oh how lucky to have that as a view! This is beautiful. I love blossom. And the colours are amazing. Thank you. This side of the road had all pink blossom and the other side of the road had the equivalent trees with white blossom. It was gorgeous. 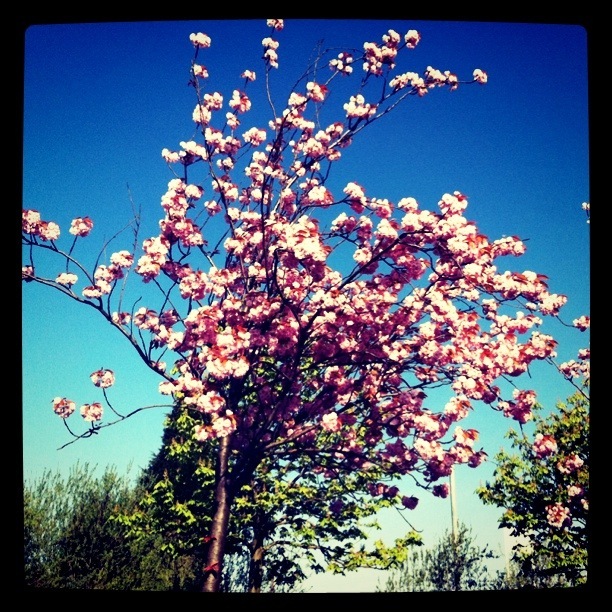 I love cherry blossom trees, I had one outside my bedroom window was a child & it reminds me of being young & carefree! very pretty indeed, spring has sprung! Gorgeous. Love the edit too, a spring tree in summer colour intensity. Thank you. I’m enjoying playing a bit with my photos at the moment, I liked the way the filter worked on this one. does anyone else want to burst into Kayleigh as they go by the trees, or is just me? Oh I haven’t heard that song in years! I’d forgotten the cherry blossom lyric.